We are excited to announce the winner of the first week of the #MyParadeInspiration social contest. 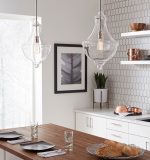 One (1) $1,000 voucher for jewelry for home lighting products from Ferguson Bath, Kitchen and Lighting Gallery. Pick your style: chandelier, contemporary, pendant, ceiling fan, bathroom lighting, or outdoor lighting selected at the Ferguson Gallery. Congrats to @jdarbywatson for winning this week! Submit an entry and next week you could be the winner! Next week’s winner will be announced live on the Parade of Homes’ Facebook page on Wednesday, Aug. 22, 2018.